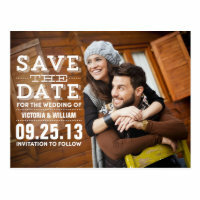 Easily personalize any of these "save the date" announcements in minutes! Add your photo to one (or both) side/s of the card, change text, font, pick size & paper type to suit your needs! No minimum order required and save money when buying in bulk! A "Save the Date" photo announcement is a couple's first impression. Traditional wedding save the dates are impersonal and staid. That is not the impression you want to make. You do not want to reside the junk mail drawer. 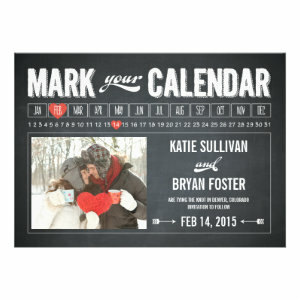 Your save the date photo postcard deserves a spot on every wedding guests' refrigerators. You can accomplish this lofty goal by making sure your save the date photo postcards have you and your fiance's personalities. If you are fun and love the outdoors, a studio picture would not reflect that. Go outside and take your photos, and Wow Party Invitations and Announcements will provide you with beautiful designs to help you create your photo announcements. 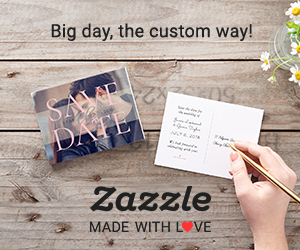 You can personalize your "save the dates" by adding your photos and text. First, you should pick which design fits you best. You can choose a country style or maybe rustic western is more fitting. Your design can coordinate with your wedding colors. Also, you are not limited to picking just one picture. Many of the designs come with an option of an engagement collage. For example, the Polaroid style postcard renders four miniature Polaroids to be displayed on your postcard. 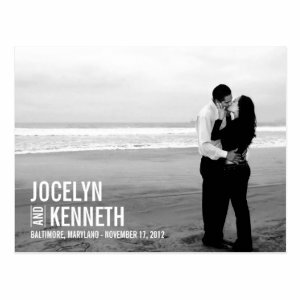 If a regular picture save the date photo design is to traditional for you, you can even make your save the date postcard look like a postage stamp. 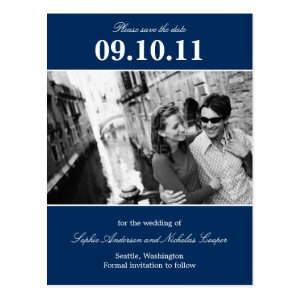 The website also offers a save the date postcard ticket design. Your special one night event should be the most sought after ticket in town. Another design option is the newspaper design, because your wedding is headline news. Once you have picked out your customized "Save the Date" photo announcements, you should enjoy all the compliments you will receive. You will make such a huge impression that people will anticipate your wedding. Try not to gloat when you visit a friend's house and see your save the date photo postcard on display. Professional and affordable custom party invitations for everyone! Easy to personalize, quick delivery and 100% money-back guaranteed!